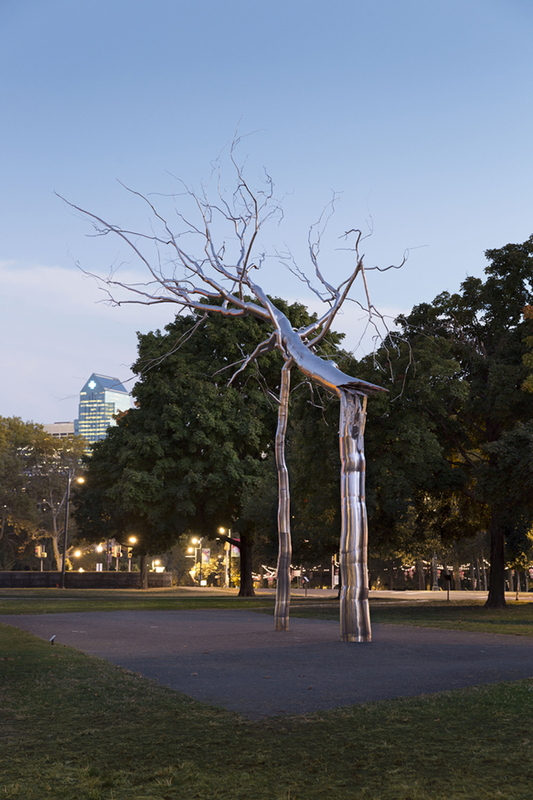 The Association for Public Art (aPA) is pleased to announce that we have received a grant from the Daniel W. Dietrich II Trust, Inc. to acquire Symbiosis (2011) by internationally acclaimed artist Roxy Paine, now installed on the Benjamin Franklin Parkway in Philadelphia. The monumental sculpture has been on temporary display in Iroquois Park since June 2014, courtesy of the artist and Marianne Boesky Gallery and with the cooperation of Philadelphia’s Department of Parks & Recreation and the city’s Art Commission. The acquisition enables Symbiosis to remain in Philadelphia and joins other significant public artworks—notably Mark di Suvero’s soaring Iroquois (1983‒1999) acquired and installed by the aPA in 2007, with the support of philanthropist David N. Pincus, and the gilded statue Joan of Arc (1890) by Emmanuel Frémiet, installed by the aPA over a century ago. Penny Balkin Bach, aPA Executive Director, said, “We are profoundly grateful to the Daniel W. Dietrich II Trust, Inc. for this wonderfully generous gift to the aPA and to the city. Such a major work by a contemporary artist of Roxy Paine’s stature is an extraordinary addition to the exceptional public art tradition for which Philadelphia is known.